Save 10% on AIM Solder’s Glow Core Solder Wire Spools. Just use our FPF012216 Coupon Code (auto applied) to get the discount. This Featured Product Friday (FPF) promo is valid from today, January 22, 2016 through Sunday, January 24, 2016. 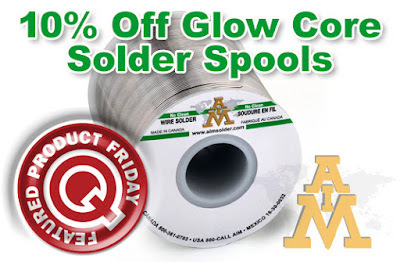 AIM’s Glow Core product offers better solder penetration into plated through holes or surface-mount interconnections, promotes good thermal transfer, and produces low-to-medium post-process residues that are electrically safe and do not require cleaning for most applications. Use the Featured Product Friday discount code as many times as you like while it is valid—and you’re encouraged to share the code with your friends and colleagues. For further questions about Featured Product Friday, please read our informational blog post, call us (800-966-6020), or send us an email. Please note: This promo is valid only at QSource.com and expires on January 24, 2016.